Renewable energy policies. As of 2016, most countries directly supported renewable energy technology development and deployment through some mix of policies. These policies seek to promote renewables in energy systems - electricity, heat and cooling and transport - through preferential treatment, reduced financing cost, regulatory support, expenditure on research and development, carbon pricing, reducing fossil fuel subsidies etc. Of 117 Nationally Determined Contributions (NDCs) submitted for the Paris Agreement of the UNFCCC in 2015, 55 included targets for increasing renewable energy, while 89 referred to renewable energy more broadly (REN21 Renewables 2017 Global Status Report). Deployment support for electricity generation. A sub-set of renewable energy policies focusses on deployment of renewable power to achieve overall policy level targets, for example, the EU 2030 Framework which aims for renewables to account for at least 27% of total energy consumption. Several countries have relied on direct schemes and subsidies to make it more attractive for companies and individuals to invest in renewable energy-based power plants. Such deployment schemes and subsidies have played a vital role in increasing the uptake of renewables across the world and are the main focus of this chapter. Note on terminology. In the literature on renewable energy mechanisms to support renewables are interchangeably called policies, support schemes, instruments, subsidies etc. To avoid confusion, in this book “renewable energy policy” refers to the general universe of renewables support, including guidance given by governments, long term-targets, non-financial mechanisms, research, mechanisms for supporting renewables in heating, cooling and transport. On the other hand, “schemes” or “instruments” refer to a specific policy used for increasing deployment of renewables in the power system by either creating financial incentives or by command. Investment vs. Production based schemes. Subsidies for renewable energy may be linked to the investment made in renewable energy projects on the ground (“investment based schemes”) or subsidies may depend upon the actual electricity generated by power plants (“production based schemes”). 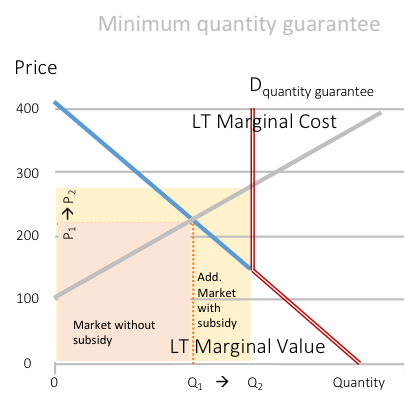 Production based schemes can either target the quantity of electricity produced (“quantity based schemes”) or set the price of electricity produced (“price based schemes”) as is depicted in Figure 2. Further, within these broad categorizations, deployment schemes and subsidies come in various flavors, as we discuss in the following. Key point: Under any scheme the level of subsidy may be determined administratively or by the market through auctions. Auction based procurement in support schemes. In the dialogue on renewable energy support policies a distinction is sometimes made between “traditional support schemes” and “auction-based procurement of renewables capacity”. This is insofar misleading, as auctions for renewables are not a distinct type of support scheme, but rather a feature that many support schemes can have. Auctions refer to the way the support level is determined, the alternative being administrative decision. The underlying instrument is the same with or without auctions. Auctions are different in that the level of support is determined by market participants and not administratively by any government department. This can prove to be of significant advantage if markets are mature and competitive and auctions are well designed and when the actual cost of renewable technology is changing rapidly but can also be a disadvantage (if these conditions do not hold). 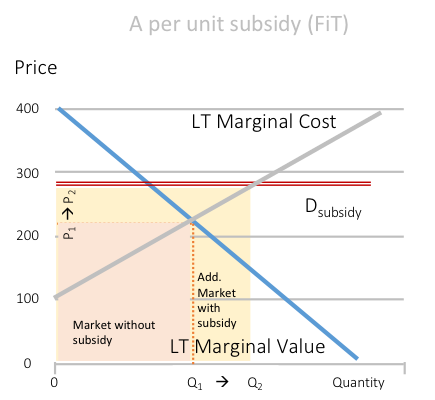 Still auctions are only a mechanism of determining the level of subsidy for the schemes discussed in this chapter and are not fundamentally a different “market mechanism”. However, given the importance of auctions in determining the level of support, we revisit them in Renewable Energy Auction Design. Several countries provided public funds through grants, loans or tax incentives linked to investment in renewable energy deployment. Such incentives can take one of the following forms. Investment subsidy. Government bears some of the upfront investment cost of setting up the project. This could be calculated either as a percentage of the total investment costs of the project or a fixed amount per MW capacity of the project. For example, in early 2016, India launched a 30% capital subsidy for rooftop solar PV installations backed by USD 750 million (INR 50 billion) to fund the new programme; the fund is expected to support 4,200 MW of new capacity (REN21). Investment tax credits and other tax incentives. Tax credits are used widely in the United States and is similar to an investment subsidy, except that another channel is used to distribute the funds: the benefit is given to the projects in the form of a tax refund rather than upfront payment. A tax credit is a dollar-for-dollar reduction in the income taxes that a person or company claiming the credit would otherwise pay the government. The U.S. tax credit is based on the amount of investment made, for example both the residential and commercial consumers can claim 30 percent of the amount invested in solar in 2019 (which will reduce to 10 percent by 2021) as reduction from the tax liability. Accelerated depreciation. Power plants are allowed to depreciate their assets at a rate that is higher than normal depreciation rates (which are linked to the average lifetime of an asset). This is helpful because as per accounting rules, depreciation can be deducted from profits and thus reduces the taxes payable by renewable energy generators. The amount of accelerated depreciation varies. For example, in Germany 20 percent extra depreciation can be claimed in first few years, while in India, 80 percent of the asset can be depreciated in first two years. In effect, accelerated depreciation are very similar to tax credits and investment subsidies. However, being embodied in the tax code, they are more easily overlooked in the public policy debate. Loans and guarantees. Several countries use direct lending by state owned financial institutions to reduce the cost at which financing is available to renewable energy banks. For example, in Germany the state owned KfW provided subsidized financing of EUR 100bn between 2012 and 2016. The Republic of Korea has pledged to invest USD 36 billion in clean energy by 2020, with 79% of the funds earmarked for deployment of renewable energy and 11% for energy storage. 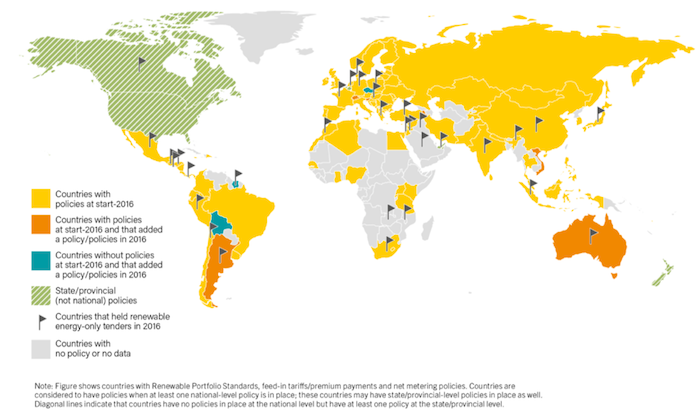 Many jurisdictions provide monetary support for generation of renewables based electricity. Some support schemes target the total quantity or renewable energy. These are discussed in the following. Purchase obligations or portfolio standards. One way to increase the share of electricity coming from renewable energy sources is to directly mandate electricity consumers to meet a certain percentage of their power demand through renewable energy. Indeed, in the past many jurisdictions have imposed such “Purchase Obligations” or “Renewable Portfolio Standards” (RPS). Usually, a purchase obligation or portfolio standard is applied on the retail supplier (electricity provider) or the distribution company instead of being applied directly on individual consumers. Of course, in a liberalized electricity market, large consumers, who directly procure power from the electricity markets or generators, may be required to meet this requirement directly. It is important to note that unlike policy level targets for that are applied at country level purchase obligations that are to be met by consumers are legally binding and non-compliance may lead to penalties. They are not mere policy goals, but proper instruments. Tradable Green Certificates. Though conceptually distinct, purchase obligations are almost always complimented by a framework of tradable green certificates. Renewable electricity generators can obtain a green energy certificate for every MWh of electricity produced by them. These certificates can then be sold in a market for such certificates to electricity providers who are mandated to purchase them. Creating such tradable certificates is useful as it allows electricity providers to buy green certificates instead of electricity from renewable energy power plants. This may be an attractive option for those who already have contracted sufficient quantity of conventional power or who cannot get renewable power contracts due to transmission or geographical constraints. More generally speaking, tradable certificates allow gains from trade, as the most efficient renewable energy sources are incentivized to produce. Similarities with “cap & trade”. The combination of purchase obligations and green certificates trading mechanism, which is a “floor and trade schemes” mechanism (as against the “cap and trade” mechanisms for CO2 like the EU Emissions Trading System), indirectly supports deployment of renewables by generating demand for renewable energy. They were one of the earliest support schemes to be deployed and continue to be used worldwide although the pace of implementation has slowed notably in recent years. Shift away from RPS. At the national level, for the second year in a row, no new policies were introduced in 2016. At the sub-national level, however, portfolio standards trends are more dynamic. For instance, in the United States, 29 of 50 states, the District of Columbia and 3 territories had targets set under RPS by 2016 (REN21). In India, where RPS is also employed at the sub-national level, the obligation is not enforced strictly and most states have moved to feed-in-tariffs for supporting renewables. Price support schemes involve a payment per unit of electricity generated to the owner of the renewable energy power plant. The most important price support schemes in use are discussed in the following. Feed-in-tariffs (FiT). A FiT is a government mandated fixed price paid to generators of renewable energy per unit of electricity generated for a predetermined period of usually 10 to 30 years. You can consider it a fixed price that renewable energy generators receive from the electricity markets. FiTs have been the cornerstone of renewable energy policies in most countries and they have proven to be an effective tool in deployment of renewable energy technologies. However, FiTs are expensive and are a bit of an anomaly in liberalized electricity markets where price of electricity is normally decided in markets for electricity. This has prompted governments to innovate to introduce instruments that are more cost effective or align better with the market mechanism. Ordinarily the FiT is higher than the market price of electricity to make it profitable for investors to finance technologies for which the LCOE is more than the market price. This is how many European countries used FiTs in the 1990s and 2000s for wind and solar, and some continue to do so for small-scale assets or nascent technologies. Power Purchase Agreements (PPA). In non-liberalized electricity markets, the tariff is written down in a Power Purchase Agreement (PPA) that is executed between the renewable energy pro-ducer and a government mandated agency/distribution company. In essence, also FiTs are PPAs, where the counterparty is usually a governmental agency, a state-owned company or the transmission system operator that is legally obliged to engage in the contract. Feed-in-premiums (FiP). In a feed-in-premium scheme, generators sell electricity in the electricity wholesale market at the prevailing price. In addition to this revenue earned in the market an additional payment (“top-up” or “premium”) is paid for each unit of electricity. The premium may be “fixed” (predetermined for the duration of the contract, e.g. for 20 years) or “sliding” (re-calculated regularly during the duration, e.g. month). Sliding FiP schemes have been used in countries like Germany (since 2014), the Netherlands and Finland and under these schemes the premium is equal to the gap between a fixed support level and the fluctuating electricity price. In a fixed premium scheme, like the one in Spain, Denmark, Slovenia and Czech Republic, the generator receives a fixed premium on top of the electricity market price. The main advantage of the premium system, in comparison to the FiT, is that it is integrated in the electricity market system and is well suited for liberalized electricity markets. Further, the fixed premium system provides an incentive to the generators to sell their electricity at the highest price possible and therefore encourages generation at times when market value of renewables is higher and so facilitates better integration of renewables into the electricity system. Contract for difference (CfD). This is a sub-set of the sliding premium FiP pioneered by the UK and deals with what happens if the market price of electricity is higher than the fixed support level. Under contract for difference, if the market price is higher a certain “strike price” the premium becomes negative and is deducted from the overall subsidy received by the power plant. This is unlike the FiP model followed in other countries like Germany, where the generator is eligible to keep any gains resulting from high market prices. Figure 3. Revenue per unit (price) received by generators under various support schemes. Key point: While all support schemes rely on some payment from the government per unit of output, they differ in how payment is determined and paid out by the government. Setting the reference price. The “reference price” or the “strike price” or the “fixed price” or the “fixed premium” under FiP can be set administratively by the government that estimates the LCOE through industry surveys, reports, expert knowledge, publicly available data and representation of interested parties. Alternatively, it can also be determined by through a competitive bidding/auction process. Other factors such as market value of renewable may also pay a role in setting the reference prices. For example, in Germany the market premium is calculated ex post on a monthly basis. It is based on the difference between the fixed tariff and the average electricity market price in the respective month. The average market prices are adjusted by technology-specific value factors for wind and PV as the prices that these technologies receive in the market are structurally different from the average price (Refer to The economics of renewable energy for a discussion of value factors). Renewable energy on average receives lower prices because high wind penetrations lead to low electricity prices in the corresponding period due to the self-cannibalization effect. Technology differentiation. The FiT or the reference price and premium in case of FiPs is often differentiated according to renewable energy technology used and may also depend on the plant type, size and location. This is because the LCOE of various technologies is different and changes with time, and because the quality of renewable resource (for example, wind speeds) changes from place to place. Revision of FiTs. The FiTs for various renewable energy sources determined administratively by governments are revised from time to time. For example, in Germany, tariffs were based on the calculation of the LCOE and revised regularly, complemented by a pre-announced, rule-based reduction pathway that depended, for some tech-nologies, on past investments. In Slovenia the feed-in tariff is based on the Reference Cost of Electricity (RCE) that reflects the overall annual cost of operating a renewable plant, minus all revenues and benefits of operation. The RCE is further split up into a fixed and a variable part. The fixed part of RCE is adjusted every 5 years or more frequently in case of substantial change of conditions. The variable part of RCE is determined annually or more frequently on the basis of forecast of reference energy market prices (DiaCore, 2014). Note that with frequent adjustments price instruments become more and more a hybrid price-quantity scheme (refer to section on Duality of quantities and prices below). Revision of FiPs/ reference prices. Under the fixed FiP scheme, premium can be fixed ex ante and held constant for the entire lifetime of the project, though it may also be revised annually as in case of the Czech Republic. In case of sliding premium schemes, various methodologies are employed for determining the premium: it may be re-calculated annually or every month or every quarter. For example, in Germany it is based on the difference between the fixed tariff and the average electricity market price in the respective month and in Finland it is calculated based on the difference between this target price and the three-month average of the electricity market price. Further Reading. For a detailed discussion on workings of FiT and CfD in Europe refer to DiaCore (2014), Klessmann et al. (2011), Goulder and Parry (2008), BMWi (2016). Production tax credits. In some schemes the subsidy is linked to the quantum of electricity generated but is not paid in the form of price support. An important example is the production tax credits in the United States, wherein a fixed payment per unit of electricity generated is made in form of tax refund and not upfront revenue. Of course, it is in effect identical to a fixed FiP. Net metering. Under “net metering” schemes the generators of renewable energy are paid for the electricity that they generate, and feed into the grid, in the form of reduction in the electricity units for which they are billed by the utility. Since this generation gets valued at the retail price of electricity, which includes cost of transmission and distribution, and is higher than the wholesale price, an inherent price subsidy is given to consumers by the utility. Net metering / net billing has usually been used to support the deployment of small-scale, distributed renewable energy systems by enabling generators to receive credits or payments for electricity generated but not consumed on site. In many cases, net metering policies have been adopted alongside other policy mechanisms, such as FiTs, that support larger-scale projects. Net metering is however coming under increasing opposition by power distribution companies who argue that the implicit subsidy paid to producers in a net metering system (retail cost of electricity - market value of renewable electricity) is too high. Some economists, for example, those looking at the net metering program in California, also agree they that are a highly inefficient means of deploying renewable energy . Other tax incentives. Renewable energy investment also enjoys other forms of tax incentives, for example, as of end-2016, Sweden removed its tax on solar production in order to advance the national target of 100% renewable electricity by 2040. At the sub-national level, Alberta (Canada) introduced a renewable energy credit funded through the province’s carbon tax on large industrial carbon emitters. In the United States, Florida removed property taxes from solar PV panels installed at businesses and manufacturing facilities, and Wisconsin authorized USD 7.7 million for rebates for small-scale, customer-based projects, including solar, geothermal, biogas, biomass and small-scale wind power for both power and non-power uses. (REN21). Sections 3, 4 and 5 explained the mechanics of various renewable support schemes. This section reviews these policies from a risk perspective i.e. how are certain risks shared between the government and investors in renewable energy projects under. Risks in Renewable Energy Projects. There are several risks involved in planning, implementation, financing and production of renewable energy projects. Electricity generators face price risk, grid access risk and social acceptance risk, and because they are highly regulated, they also face regulatory risk and political risks. In addition, new renewable energy technologies, like all nascent technologies, face social acceptance risk and may struggle to access the large quantities of financing until the technology has been proven. Renewable energy projects in developing countries may face addition risks owing to macroeconomic conditions like the risk of sharp depreciation of the home currency. Policies targeted towards offsetting these risks or compensating generators for such risks through monetary and non-monetary support schemes can attract private investment into the sector and for quickening the pace of technology diffusion. Risk and cost of financing. An important consequence of higher risk perception of new technologies is that it pushes up the cost of finance because investors of both debt and equity require a higher return to compensate them for higher investment risks involved in new technologies. For example, power market risks and exchange rate/macroeconomic risks can increase the cost of debt by up to 1.5 percentage points and cost of equity by up to 2 percentage points for wind energy projects in developing countries (Waissbein, Glemarec, Bayraktar, & Schmidt, 2013). Further, as discussed in Cost of Renewable Energy, since investment expense makes up a larger portion of over-all costs, increase in financing cost increases the LCOE of renewable energy technologies more than that of conventional power plants. By reducing the overall price risk involved in renewable energy power projects, deployment schemes subsidies can thus also significantly reduce the cost of renewable energy and make it more competition vis-à-vis conventional power plants. Investment vs. production support schemes. An important distinction between production-based support schemes and investment schemes is that in the former investors receive subsidies over the lifetime of the project, while in the latter subsidies are paid out relatively the early on in the lifetime of the project, either at the time of initial investment or at discrete periods during the first few years of the operation of the project. As discussed in Economics of Renewable Energy, this matches the natural cost structure of renewable energy projects where up-front investment expenses make up most of the costs, with annual operational and maintenance expenses being relatively small. This natural alignment with “cash flow” of renewable energy projects makes investment based subsidies attractive to project developers as it can reduce the amount of equity and debt that they have to put into the project. But for the subsidizing authority, it poses a risk that developers may put up investments that do not generate the amount of electricity as was projected or required. So, investment based support schemes need to be complimented with incentives for reliable generation. Price vs. Quantity based schemes. Within the class of production-based schemes, Quantity based Renewable Portfolio Standards and the associated tradable green certificates schemes ensure that a minimum amount of renewable energy will always be demanded by the market but the price would depend on the wholesale market price of electricity. In addition to the price of electricity, generators also earn revenue from the associated green certificates but that carries an additional risk - the volatility in the price of green certificates. 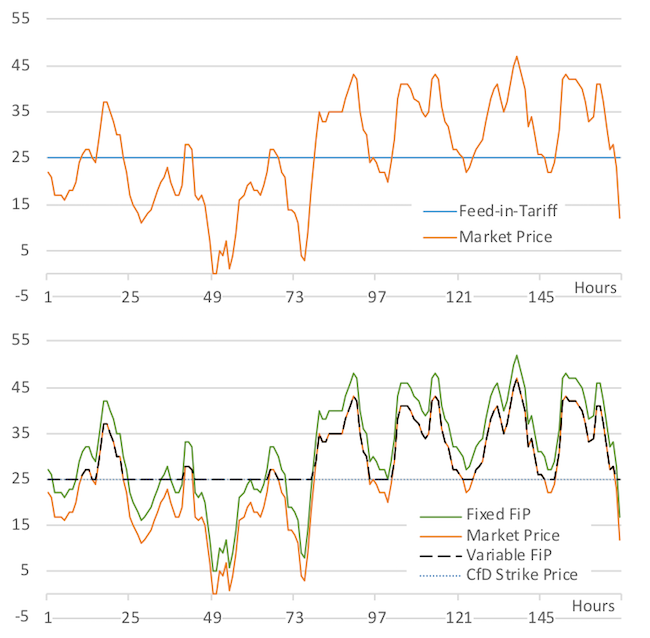 So, compared to a simple price based scheme like Feed-in-Tariffs, investors face higher risk in the form of electricity price and certificate price volatility. This has often been cited as the reason why RPS-certificate schemes have not been as effective as FiTs. Further, one analysis of RPS-certificates schemes in Sweden showed that even if the certificate market proved to be effective, consumers cost could have been substantially higher because investors charge a higher financing cost to compensate for the price risks (Bergek and Jacobsson, 2010). Risk sharing in price based schemes. Production schemes support offer generators varying certainty about the price they will receive. In other words, schemes support renewables by absorbing price risk to varying degrees. From a risk perspective feed-in-tariffs (or fixed price long term power purchase agreements) provide maximum security to the investors as the government bears all the market risks. This is also true for a sliding premium schemes which not only guarantees a minimum price to investors but also allows them to benefit from increase in price above the minimum price . In case of contract for differences, the benefit is shared between the investors and the government. A fixed premium scheme, by contrast, only provides a cushion above the market price and all of the volatility in electricity prices has to be borne by the generator. By passing on the risk to the generators and investors, the fixed premium system allows for better investment and production decisions by investors and generators. It provides incentives to investors to adapt generation to demand to get the best return. Figure 4. 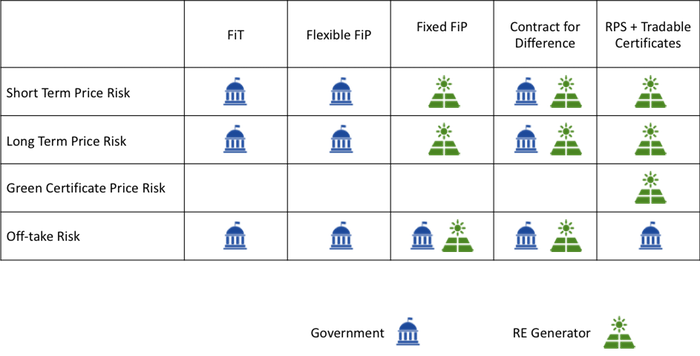 Risk sharing between generators and government under various production schemes. Risk-return equivalence. In markets like Spain, where investment in renewables is done by electricity utilities or other actors who can manage the risk, investors prefer the premium system to FiT because they can achieve a higher return by selling electricity at higher prices and also earning a premium. FiT on the other hand seems to be preferred by investors who are too small to manage risk, for example households, or for the technologies that have not reached yet a high market penetration and need to build a market environment. We have discussed several support schemes that have been used to increase deployment of renewables over the last two decades to increase the quantity of renewable energy provided by the market. They achieve this either directly ensuring that a predetermined quantity of renewable energy is provided by the market or indirectly, by influencing the price of these technologies in the market. It is important to note that there is a symmetry between quantity and prices. Using mechanisms that sets the quantity of renewables operating in a market for the renewables always implies a price for them. Similarly, if the market price of renewables is influenced, it necessarily implies a corresponding quantity that will be traded in the market. Under idealized conditions, there is one-on-one correspondence between price and quantity schemes. Figure 5. Equivalence of price and quantity. Hybrid instruments. 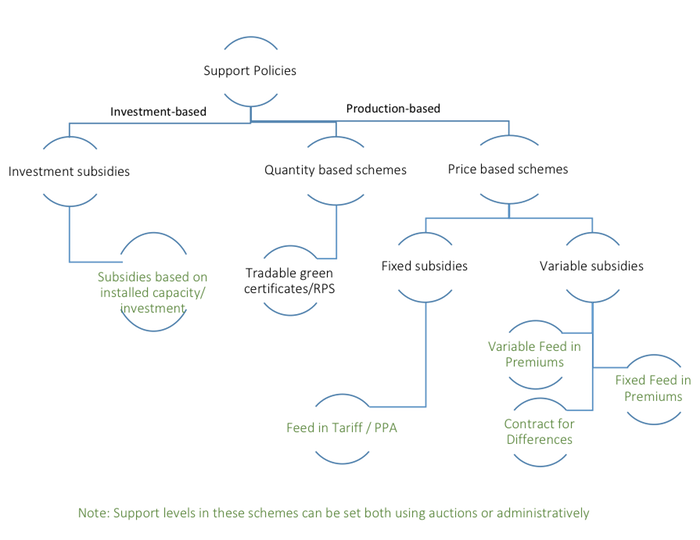 Of the different production-based support schemes discussed in this chapter, Feed-in-tariff and Feed-in-premium are classic price-based instruments, while Renewable Purchase Obligations are pure quantity-based instruments. But the classification is not always clear-cut. A classic instrument sets the target (price, quantity) once and then let it in place over a long time. If a quantity instrument is adjusted frequently in light of equilibrium price (e.g., more ambitious goal because of “cheap” price), it becomes a hybrid instrument. Similarly, if a price instrument is adjusted frequently in light of outcome quantities (e.g., overshoot or underperformance), it becomes a hybrid instrument. For example, the “Atmender Deckel” in Germany is a price instruments with limits on quantity, while the proposed floor and ceiling price for carbon emissions under the EU ETS would be a good example of a quantity instruments with elements of price determination. Such instruments are, of course, more complex to administer but may help us achieve a more efficient outcome. But be it a classic or a hybrid instrument, it is important to ensure that the signals provided by the various schemes are compatible. Technology neutral vs. technology specific schemes. While setting the support price or quantity for renewable energy, governments can either set the same level of support for all renewable technologies or set different support levels for different technologies. Technology differentiation may be quite rough (for example, solar, wind and biomass) or very fine (for example, there were over 1000 different tariffs for biomass plants based on choice of fuel, size, locations and technology in Germany at one point). Windfall profits. The competitive pressure in technology neutral schemes that is required to attain static efficiency only affects technologies that are at the higher end of the cost curve. If one type of technology is, or becomes, significantly cheaper it does not need to search for cost reduction potentials and can secure the price of the more expensive technologies to earn windfall profits. Theoretically, technology differentiation can solve this problem by setting different prices for different technologies. By setting the prices for different technologies the government can recoup some of the technology specific profits or “rents” to decrease the overall cost of support. Figure 6. Technology neutral vs. technology specific support prices. Key point: In theory, price discrimination may reduce producer rents (“windfall profits”) paid to renewable generators. It does not, however, improve economic efficiency. Static efficiency. In Europe, the European Commission has strongly favored technology neutral schemes, which according to it will result in greater competition between different technologies and enable the most cost-effective technology to be deployed. Thus technology neutral auctions are said to guarantee “static efficiency” i.e. at any given point in time the most cost efficient technology will prevail. In spite of this obvious benefit, technology neutral schemes are not popular and many countries have chosen to use technology specific schemes for one or several of the following reasons. Dynamic efficiency. While technology neutral schemes can lead to short-term generation cost minimization, they are usually seen to fail to acknowledge the possibility of future cost reductions of currently more expensive technologies and thus generally only select the presently cheapest and most mature technologies. As such, a technology-neutral selection process can entail long-term inefficiencies, i.e. higher generation costs in the future, as a result of unexploited learning effects. Technology specific schemes therefore can be dynamically more efficient, if the government does a decent job anticipating long-term cost levels. System costs. The condition of static efficiency of technology neutral option may not hold once system integration costs like cost of grid expansion and improvements and balancing costs are taken into consideration. Often renewable energy producers are not made responsible for covering this cost. Consequently, a project with lower cost from an overall system perspective may lose out against a project with higher system costs in a technology neutral scheme. Pitfalls of technology specific schemes. In spite of these advantages, technology specific may get locked into inefficient, long term prices. This is because technology specific prices are linked to cost of generation of each technology, which is known best to generators and not the regulators setting prices. Lobbying activities by generators might render price discrimination under technology specific support schemes inefficient, leading to higher prices for technologies and more expensive renewables being built.